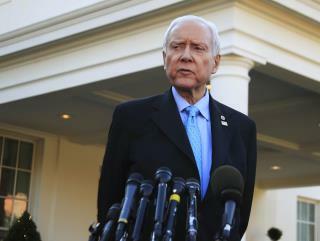 (Newser) – After almost 41 years in office, Utah's Sen. Orrin Hatch is the longest-serving Republican senator in US history—and President Trump apparently wants the 83-year-old Senate Finance Committee chairman to seek another term in 2018. Sources tell Politico that Trump, who will appear with Hatch at an event in Salt Lake City on Monday, is pushing for Hatch to rethink retirement plans because he doesn't want Mitt Romney to run for the seat. The sources say Trump not only wants to keep Romney—a prominent "Never Trumper" before last year's election—out of the Senate, he wants to keep Hatch around because he values the loyalty the senator has shown since the early days of his campaign. Watch any video from Senate proceedings with Hatch over the last year or two - the guy is losing his marbles. His politics aside, he needs to retire. As for Romney - I liked him as governor here in MA, he did a decent job. Not sure if people will appreciate his state hoping though. TERM AND/OR AGE LIMITS...FOR BOTH SIDES. Jesus. My parents can barely take care of their own finances, and they are almost 70. How can we run a government will all these old a$$ people?